Now in it's second printing. In November of 1991 Robert Frank went to Beirut on a commission to photograph the city’s devastated downtown in the aftermath of the Lebanese civil war (1975-1990). Much of the work he did there, together with that of five other photographers with whom he shared the assignment, was put together in Beirut City Centre by Editions du Cypres in 1992. Alongside that commissioned work, he also made Polaroids of the city and its environs, which, on his return home, he stowed away in his studio. It was only many years later that he considered those images again, and used them to create a sketch-book’s worth of Polaroid collages. Come Again is a facsimile reprint of that notebook. In recent years Frank has worked almost exclusively with Polaroids, exploring the collage and assemblage possibilities of the instant photograph. 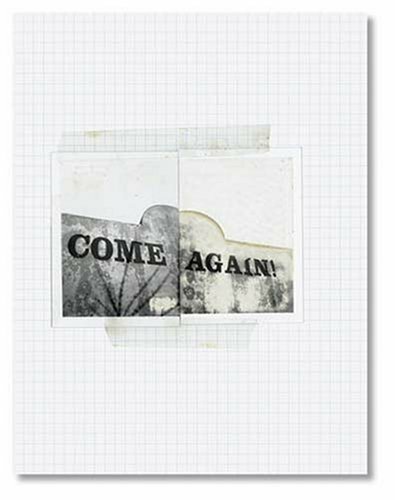 Come Again, which comes as a sewn softcover in a paper bag, printed with special four-color matt inks and a Polaroid varnish, offers insight into the early stages of Frank’s experimentation with the Polaroid and presents a previously unseen artist’s book.